Welcome to the next instalment of "Sarah experiments with avocado desserts!" You may remember my previous avocado baking experiments: Vegan Chocolate Avocado Cake with Chocolate Avocado Icing; Avocado Chocolate Marble Pound Cake; and Dense Chocolate Avocado Brownies. 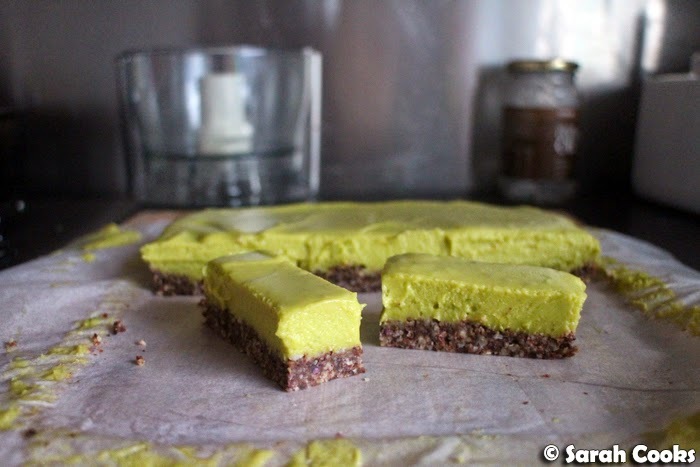 I really stepped out of my comfort zone with this one - a gluten free, dairy free, (almost) raw, (almost) vegan avocado and lime "cheesecake". I'd been interested in how the creamy texture of avocado would stand up in an uncooked dessert (raw cheesecake, smoothies, ice-cream etc. 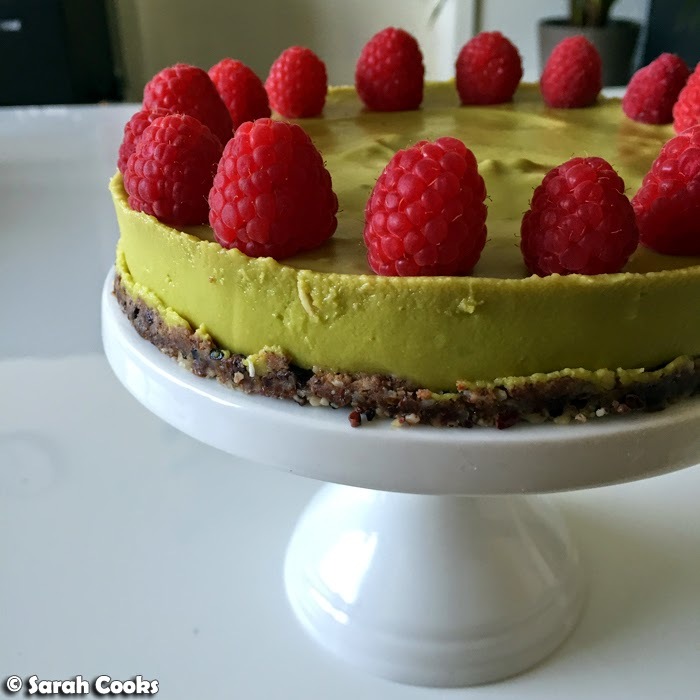 ), and much Googling led me to this raw cheesecake recipe in The Telegraph by bloggers Hemsley & Hemsley. I tweaked the recipe quite a bit, but the structure follows theirs, and I imagine you could use this structure to make your own different flavoured raw cheesecake creations. 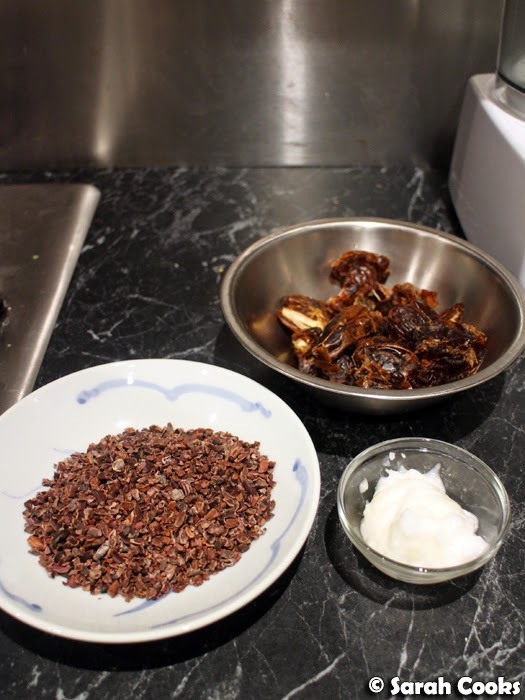 The base is made up of nuts, coconut, cocoa nibs, dates and coconut oil, whizzed in a food processor until sticky and crumbly - a similar mixture to what you'd use for bliss balls or raw brownies, that type of thing. I did say that this cake was "almost" raw, and that's because I toasted the hazelnuts and desiccated coconut. You could always leave out this step if you are after a strictly raw recipe, but (obviously) I don't follow a raw diet, and toasted nuts and coconut just smell too good! This mixture gets pressed into a lined tin. The original recipe says to use an 18 centimetre springform tin, but there was way too much mixture for that! I divided the base between an 18 centimetre springform and a 20 centimetre square tin. Now, the filling. The bulk of the filling is provided by avocado flesh (I found that two of my giant Reed avocados from Barham Avocados made up the required 560 grams!) and a generous amount of coconut oil. (I later realised that the coconut oil helps the mixture stay solid). Either way, the ingredients are whizzed together in a food processor until smooth and creamy. From here, you just need to pour the mixture into your prepared tins and let them set in the fridge overnight. Surprisingly, the cake travelled well. I sliced it at home, gently transferring the slices to a tupperware container, and they managed to make it to work intact! (Remember to keep them in the fridge, as the filling starts to soften if left out at room temperature for too long). The round one was quite pretty too - I decided to decorate it with raspberries, because I love the colour combo of pale jade and vibrant red. However, it didn't just look nice, but tasted good too - the gently sweet raspberries really complimented the strong sour lime taste of the cheesecake. I managed to transfer the entire cake from the tin to the serving plate for photos, and then back to the tin to transport to my parents' house, where we had it for dessert tonight. It didn't break - phew! I really liked the cheesecake - it had a great creamy texture, and I liked the sticky-soft base with the fragrance of coconut and crunchy pops from the cacao nibs. I think I might amp up the chocolate factor next time and add a bit of cocoa powder to the base (similar to Hannah's raw brownies, which I love), but other than that, I like it just as it is. 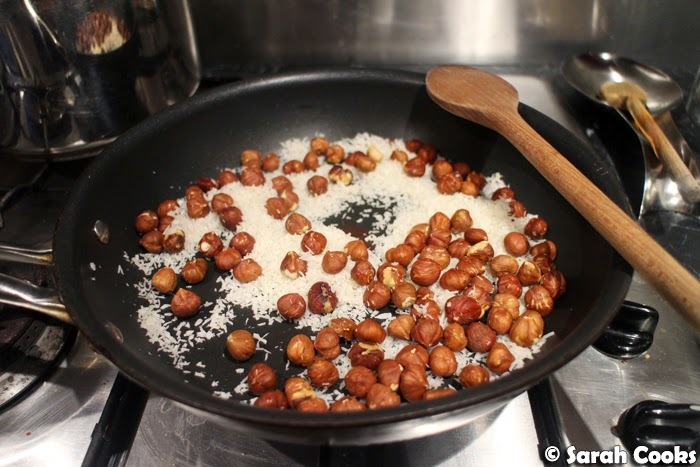 Place the hazelnuts and coconut in a dry frying pan. Toast over a medium heat until fragrant and lightly toasted. Set aside to cool. 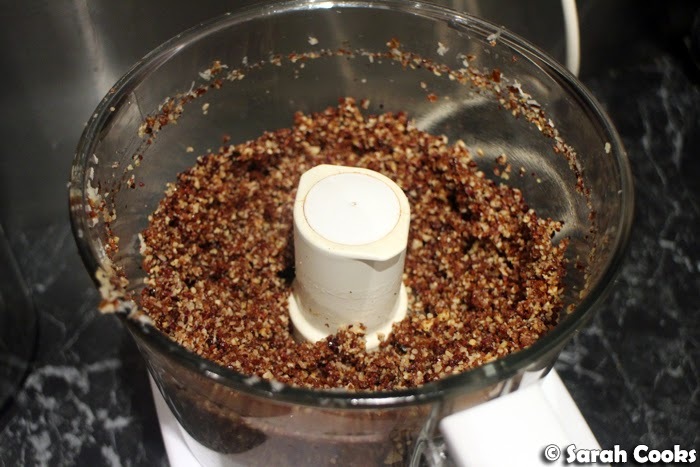 Place all ingredients in a food processor, and blend until the mixture is crumbly and holds together when pinched. Line a 20 cm square tin and an 18 cm round springform tin with baking paper. Divide the mixture between the two tins and press down firmly. Place in the fridge while you make the filling. 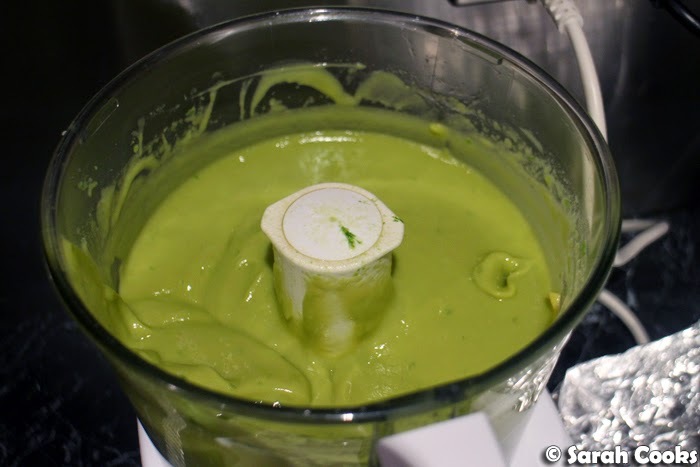 Place all ingredients in a (clean) food processor, and blend until smooth. Taste and add more honey or lime juice as required. Divide the filling mixture between the two tins, and smooth the top with a palette knife. For the square tin, you can lift the entire cheesecake out at once using the baking paper. Decorate with raspberries if desired. For the round tin, gently run a knife between the edge of the tin and the cake, remove the side of the tin and gently slide the cake onto a serving plate. Decorate with raspberries to serve if desired. These looks absolutely gorgeous though, and pretty do-able! Love the colour it's come out! Gluten free, Dairy free- wow you've got all bases covered here! What about Paleo? (Just kidding)! 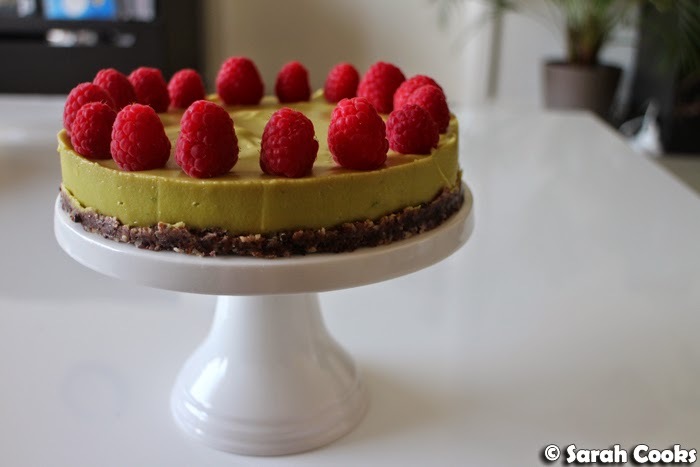 I love avocado but never tried using it in a cake- I'll have to turn 'hipster' and give a try! Yuuuum. Could you taste the avocado at all, or was it just a texture thing? I'm a big fan of this -- particularly because so many cheesecakes have gelatin in, which isn't good for us veggies! Lol I was just thinking this is Paleo friendly and then I read Fran's comment! Anything with avocado has to be good. Looks beautiful! I need to check to see if my colleague has honey actually - she's gluten-free vegan, but I think she might actually indulge in honey? I'll have to check, cause this could be the perfect treat for her! This looks fabulous! 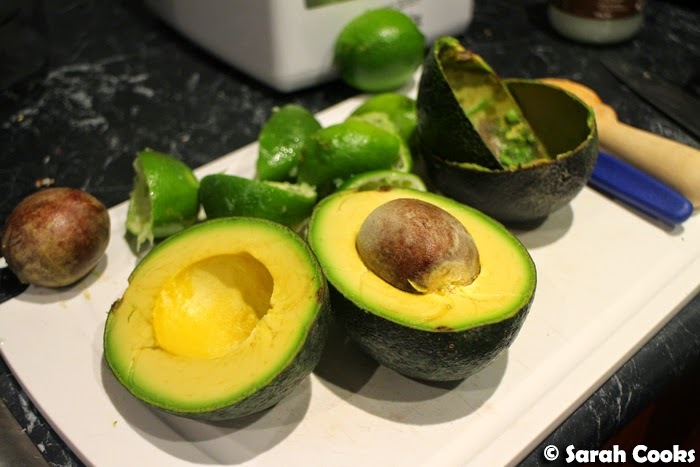 I always wanted to make something out of avocado and this one will definitely be on my list!